We’ve had our second Virtual Brown Bag Meeting today. At some point, there were 15 attendees; I noticed some were at the first meeting, and some were new to it. Hopefully we’ll see this number increasing in the future. How to set keyboard shortcuts to increase/decrease the editor’s font site (look for the IncreaseTextEditorFontSize and DecreaseTextEditorFontSize macros). Here’s a link to the recording, in case you’ve missed it or want to go back and revisit some of the points. Next week I will be out to a client and won’t be able to attend to the meeting. We’ll find somebody to start off the meeting and promote others to presenter as the meeting goes on. The material from the presentation can be downloaded here. When I do my presentation on “productivity”, one of the things that I always mention is “brown bag meetings”. The concept has been introduced to me by good buddy Lynn Evans, and we’ve been doing it at the company (less often than I’d like) for some time now. I’ve also got some of our clients into doing it, and they always give me feedback saying they’re glad I got them into it, and they’ve been holding weekly meetings every since. So who’d they have “brown bag meetings” with? In order to cater for that, we’re starting a “virtual” brown bag meeting. The meetings are going to be hosted by the Virtual ALT.NET website through LiveMeeting (one of the most important aspects of ALT.NET is “continuous improvement”, and that’s what the brown bag meeting is all about!). We’ll start doing it every Thursday, from noon to 1pm (Central Time). Depending on how things go, maybe different groups can held the meeting at different times so to account for different time zones. 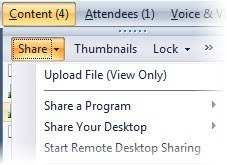 In order for this to work, it’s vital that more than one person bring something to share. Of course, if we end up having a large number of people, it may not be possible for everybody to share, but we’ll figure something out if that turns out to be the case.